The world’s largest new-build 100% biomass power station by Robert Giglio & Timo Jäntti, Sumitomo SHI FW. Scale economics, fuel availability, and environmental impact have generally been the key factors determining utility-size power plant design choices. A good illustration of this axiom is the 299 MWe Tees Renewable Energy Plant (TeesREP), a combined heat and power facility being built on a brownfield site at Teesport near Middlesbrough, UK. It is the world’s first 300-MW-class 100% biomass-fired new-build power plant. It will also be the world’s largest CFB (circulating fluidised bed) plant firing only virgin biomass, sourced from international sustainable sources. TeesREP is expected to enter commercial service in January 2020. The principal driver for TeesREP was environmental, that is, helping to decarbonise the UK power generation industry in order to help the country meet its CO2 emission reduction targets. Natural gas and nuclear energy are also part of the UK approach to reducing carbon emissions. But the future cost of natural gas is uncertain, and likely to be quite volatile. Nuclear energy is carbon free but nuclear new builds are controversial and have an uncertain lead-time. Utility-scale biomass-fired power plants qualify as renewable but have all of the dispatchability advantages of a fossil-fired plant, with none of the disadvantages commonly associated with other renewable technologies. When biomass is employed in a conventional steam cycle it produces firm baseload capacity, unlike intermittent solar and wind technologies. Also, biomass combustion is considered carbon neutral because sustainably managed forests act as a net sink for carbon dioxide from the atmosphere. Carbon released during biomass combustion returns to the atmosphere but is removed by the forests. While wood chips and wood pellets are the dominant biomass fuels in use today, the range of available biomass materials for use as fuel is vast with new sources regularly entering the fuel market (see map on next page). The biomass fuel market is no longer dependent upon locally produced biomass but may now be procured from a variety of sources in a growing global fuel market. The carbon footprint of biomass plants doesn’t change with plant size, unlike other fossil-fueled technologies, but increased size does improve project scale economics. Dispatchable, utility-scale, CFB-based biomass projects are an attractive option. As an added bonus, TeesREP also qualified for subsidy under the UK government’s Contracts for Difference scheme, designed to support low carbon technologies. The plant will thus receive revenue from the sale of electricity as well as from the CfD, which provides a variable “top-up”, reflecting the difference between the electricity market price and a fixed strike price (adjusted for inflation). CFB technology in addition provides the plant owner with additional fuel supply options, such as burning agricultural biomass and other forms of locally-procured opportunity fuels with high moisture content. Sumitomo SHI FW has commissioned more than 490 CFB boilers to date, of which approximately 120 are designed for firing some portion of biomass, with 54 units firing biomass as the primary fuel and over 20 CFB plants firing 100% biomass. Until TeesREP is commissioned, the world’s largest CFB based power plant firing 100% biomass remains ENGIE’s 205 MWe (447 MWt) Polaniec unit 8, located in Poland. Known as the “Green Unit”, this has been in commercial operation since November 2012. In 2016, the Green Unit operated with a net efficiency of 36 .5% and produced 1.52 TWh, representing about 25% of Poland’s renewable power generation. It fires a mixture of 80% wood chips and 20% agricultural wastes sourced within a 100 km radius of the plant. Sumitomo SHI FW provided a turnkey delivery of the boiler island, fuel yard, and other auxiliary equipment. The Teesside CFB design is a scale-up of technology successfully used by the Green Unit. Likewise, Polaniec unit 8 built on the technology and experience base of earlier plants burning 100% biomass fuel, such as Kaukas Kaukaan Voima Oy’s 125 MWe power plant, located at the UPM-Kymmene Oyj paper mill site in Lappeenranta, Finland (385 MWt), Kraftringen Energi AB, Örtofta, Lund, Sweden (110 MWt), and ZE PAK, SA, Konin, Poland (154 MWt). TeesREP will be the largest facility of its kind, though not physically bigger than the latest CFB units firing fossil fuels because of the dry, high-quality fuel supply. In addition to a 50% increase in plant rating relative to what has gone before, TeesREP’s steam conditions reflect recent technology advances that will also produce increased efficiency. For example, the Polaniec unit 8 CFB boiler produces steam at 127.2/20 bar(a) and 535/535°C (superheat/reheat). Thus far the limitations on steam conditions have been mainly due to commonly identified corrosion issues arising from combustion of biomass and waste derived fuels attributable to the presence of ash forming elements such as halogens (notably chlorine), alkali metals (mainly sodium and potassium), phosphorous and heavy metals (eg, lead, zinc). At Teesside steam conditions have been pushed to 176/43 bar(a) and 568/568°C. With sufficiently clean biomass and the state-of-the-art design, high availability and acceptable lifetimes for boiler pressure parts can be achieved at these steam pressures and temperatures. 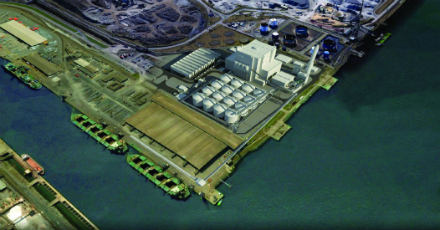 At TeesREP, the plant fuel will be 70-100% wood pellets sourced from sustainable forest byproducts in North America delivered by Supramax size vessels to the port at Teesport. The remainder of the biomass fuel to be used in TeesREP will be in the form of sustainable wood chips delivered overland, primarily from the UK. The wood pellets contain little moisture (5%), ash (1%), and sulphur (0.02%) and therefore produce low emissions. The pellets also have an excellent fuel heating value of 17.8 MJ/kg. When the wood pellets are mixed with 30% domestic wood chips, with an 18.5% moisture content, the fuel heating value is reduced to 14.95 MJ/kg. The boiler can accommodate a highly variable mixing ratio. The steam cycle design includes provisions to deliver low pressure steam to the wood chip dryer, of the order of 6 MWt, to reduce the moisture content of the incoming wood chips, thus maintaining the plant’s CHP status. The fuel will meet a sustainability threshold in terms of sustainable timber harvesting and CO2 footprint based on fuel supplier guarantees. The Teesside boiler steam conditions of 568°C and 176 bar(a) were selected for maximum steam cycle efficiency. The clean fuel envisaged allows these steam conditions to be achieved, which is about the maximum applicable in natural circulation boilers. Steam temperatures that produce high cycle efficiency also allow acceptable superheat and reheat boiler tube life with clean biomass. At Teesside, the CFB boiler and auxiliary equipment are located in an enclosed building. Gas side. Flue gas leaving the top of the furnace first enters steam-cooled high- efficiency solids separators. Separated solids are conveyed to the return leg and returned to the furnace. After the back pass convective heat exchanger and catalyst, the flue gas stream is divided for the rotary air preheater (RAPH) followed by the bypass economiser, which heats up part of the boiler water extracted from the turbine island, thereby reducing the demand for steam turbine extraction steam. These parallel streams are joined before the flue gases are cleaned in a high-efficiency baghouse. Between ID fans and stack, gases are cooled down to a potentially corrosive temperature so a corrosion resistant flue gas water heat exchanger with plastic tubes is used. Steam side. A regenerative steam cycle with reheat, which produces the highest plant efficiency, is employed at Teesside. The high-performance steam turbine has four low pressure stages and three stages of high pressure feedwater heating. A 40-cell air-cooled condenser designed for 10°C operation is used to condense the steam from the steam turbine exhaust. Steam leaving the high-pressure turbine is brought back to the boiler for reheating. The first stage reheater is located in the convection pass and it is equipped with a steam side bypass used for reheat steam temperature control. At higher loads, part of the reheat steam bypasses the first reheater (RH I), which reduces heat absorption and hence reduces RH II inlet steam temperature. In this design configuration, reheat steam control is normally not required thereby avoiding the reduction in plant efficiency usually experienced by typical fossil- fuelled plants. Final reheating (RH III) is performed in two INTREX heat exchangers submerged in the bubbling hot solids in the lower furnace and protected from corrosive elements in the combustion gases. A closed cooling water circuit transfers heat into combustion air upstream of the RAPH (rotary air preheater), replacing auxiliary steam normally needed in the first stage of air preheating. As a result of lower flue gas exit temperature, lesser steam extraction and auxiliary steam consumption, the boiler efficiency and overall process efficiency are improved. A similar system has been in successful operation at the 458 MWt biomass CFB boiler in Jyväskylä, Finland since 2010. The steam plant is designed to operate in a modified sliding pressure mode in order to maximise efficiency over its load range and to allow the unit to respond to rapid load changes when operating at base load conditions. To do so, the high pressure steam pressure is set based upon the operator’s load demand signal and the CFB boiler operates to maintain the desired HP steam header pressure, when operating between 40% and 100% load. The HP steam header set points are derived from a transient study of the plant so it may fulfil the frequency response required by UK’s National Grid. Primary frequency control is 5% load change within 30 seconds. Secondary frequency control requires 3-5% of maximum continuous rating near minimum and near maximum load between 30 seconds and 15 minutes. Also, the plant must respond to a 10% load change in 10 seconds and maintain that load for 30-60 seconds. For short term transients, sufficient steam pressure is maintained upstream of the steam turbine control valves in order to effectively respond to grid frequency dips. For long term transients, the CFB firing rate changes in order to respond to a grid transient. Also, the Teesside CFB may be over-fired to achieve a 10% step change in load in 10 seconds. The emission limits set for this project are in line with the new IED and LCP-BREF requirements. The controlled pollutants include SOx, NOx, dust, CO, NH3 slip, Hg, HCl and HF. CFB combustion technology, by its very nature, provides the mechanisms to reduce various pollutants to acceptable levels. However, the strict LCP-BREF limits also require additional measures. For example, several technologies are available for control of acid gases (SOx, HCl, HF) and heavy metals (Hg), such as CFB scrubbers and spray dry absorbers. However, in biomass combustion applications the simple and proven dry sorbent injection (DSI) technology is considered more economic. In DSI, powdered sorbent (calcium hydroxide or sodium bicarbonate) is pneumatically injected into the flue gas, acid gas is adsorbed onto the sorbent, and dry waste product is removed via a particulate removal device, fabric filter in the case of TeesREP. It is a simple system with low capital cost and also low operation cost when the required level of acid gas removal is moderate. However, DSI has limited SO2 removal capability. For TeesREP, DSI may be required with some high-sulphur wood supplies but isn’t needed with normal clean biomass. Powdered activated carbon can also be injected for the control of mercury together with dioxins and furans. Selective non-catalytic reduction (ie ammonia injection into separators and/ or into furnace depending on load) is used for NOx control. A slip catalyst in between two economiser stages minimises NH3 slip during SNCR utilisation. In summary, as well as providing nearly CO2 free power by using renewable fuels, the plant will fulfil the most stringent guaranteed emission limits for “traditional” air pollutants: 35 mg/Nm3 SO2; 140 mg/Nm3 NOx;50 mg/Nm3 CO; and 5 mg/Nm3 dust (O2 6% in dry gases). For a wide range of biomass and waste fuels circulating fluidised bed boilers provide considerable fuel flexibility, high steam parameters, and good reliability. As the Teesside project demonstrates, utility-scale 300-MWe-class subcritical CFB units can be employed for 100% biomass applications. For 50% biomass co-firing with fossil fuels, 600-MWe-class CFB units are available, while 800 MWe ultrasupercritical fossil fueled CFB plants can be co-fired with up to 20% biomass.